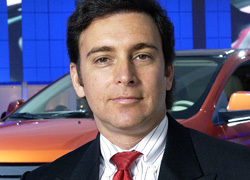 The pending confirmation of cash-for-clunkers guidelines sets the stage for &#8220;an exciting last 10 days of the month,&#8221; says Mark Fields. DEARBORN, MI – The upcoming government-sponsored “cash-for-clunkers” program should have a positive affect on the automotive industry, but likely won’t lead to a dramatic spike in sales, a top Ford Motor Co. executive says. “I don’t think it will have as a significant effect as it had in Germany, because the program was constructed differently,” Mark Fields, president-The Americas, says during a media event here. “But it’s sending a positive signal to consumers that, ‘Hey, maybe now is a good time to buy.’ And I think that’s good for the entire industry. Fields says the industry has stabilized, and there are signs an economic recovery is on the horizon. “From our perspective, (auto sales declines) have bottomed out,” he says. “When you look at some of the health metrics of the economy, it’s basically telling us things have stopped getting worse. As for July, Fields says it is too early to predict Ford’s monthly sales results until the cash-for-clunkers rules are known. The official guidelines governing the program are expected to be revealed before month-end. So-called cash-for-clunkers rewards consumers for buying vehicles that are more fuel-efficient than their current cars and trucks. Fields says Ford also is keeping a watchful eye on its supply base, which has been hard-hit hard by the global recession and bankruptcies of the former General Motors Corp. and Chrysler LLC.